When The Fire Falls! Result! Let the fire fall! Let the fire fall on me Oh Lord and ignite your Spirit within me. Let the fire of God Most High fall upon my family, Church, Community, and Nation and set our soul on fire! We want to see Jesus lifted high, a banner that flies across the land, that all men may see and know, that He is the way to Heaven! Oh that the fire will fall upon us and cause rivers of living water to flow from out of us –John 7:38. Let this living water flow to quench other’s thirst. Bless me and make me a blessing Lord – Genesis 12:2. You Oh Lord!, you are a consuming fire – Hebrews 12:29, Deuteronomy 4:24. And you, Heavenly Father, lives within us by your Holy Spirit – Romans 8:11 But if the Spirit of Him who raised Jesus from the dead dwells in you, He who raised Christ from the dead will also give life to your mortal bodies through His Spirit who dwells in you. I pray Oh Lord in Jesus mighty name that your living water will flow out of me to refresh troubled souls, use me to quench the thirst for others. And as a consuming fire that dwells within me, let the fire flow out of me to consume every wickedness wherever I am. Make me terror to the Kingdom of darkness. Let the dread of Christ in me fall upon every force of darkness as they come in contact with me. Let strangers flee out of their hidden places as I open my mouth and you fill it up with your words – Psalms 18:44-45. 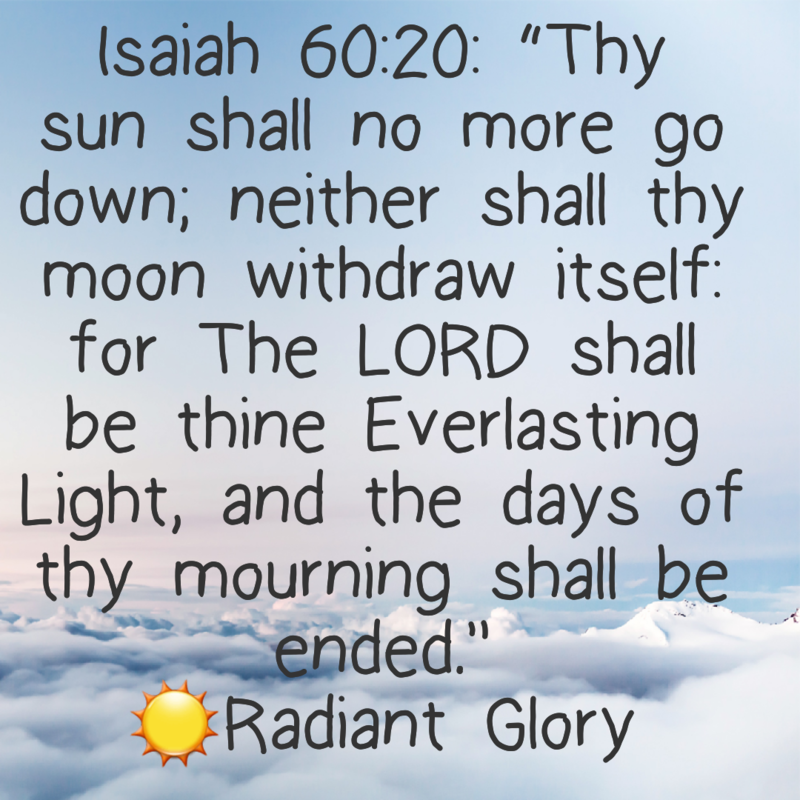 Your Sun Shall Rise Again! Mine Too! Your Sun shall rise again! Your Sun shall rise again! The bible says that there’s hope for a tree that is cut down, for at the scent of water it shall bud again – Job 14:7! The devil thought he got you! He underestimated the love of the Father for you! Oh! How he fought to quench the fire within your soul! He buffeted you on every side, in the valley he came, on the plains, the mountaintop, on the crooked path and rough places. He would not let you rest, but, but, oh but! He underestimated your resiliency by the force of the Spirit within you. I am announcing to you today my friends! YOUR SUN SHALL RISE AGAIN! 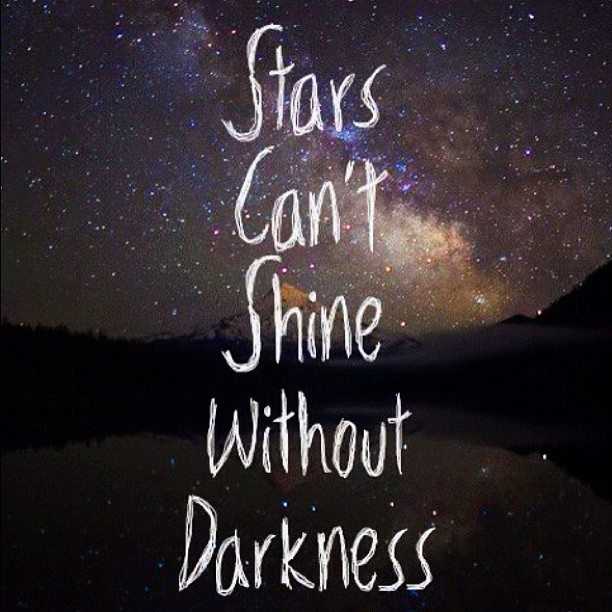 It will shine even brighter than you can ever imagine. Had they known, the devil and all his agents, the troubler of your life! Had they known, they would not have pressed you to the wall. They tried to suffocate you with the cares of this world. They ended up helping you, for what they meant for evil, the Lord Most High, the All-Knowing, All-Seeing, Only Wise One used to mine the goldmine of greatness within you! You are more than conqueror my dear through Christ who loves you – Romans 8:37. No one can stop the moon from coming out at night time, nor the Sun from rising in the morning, or cover up the stary host! No one can stop your Sun from rising and shining. The Ancient of days has arisen on your behalf. The clouds are dispersing! Can you see your Sun? Look! There! Can You see? That is your Sun rising in its place. The hand of the Most High God shall keep it up! You Sun will not set until your assignment is complete! Hallelujah! Amen! Congratulations! 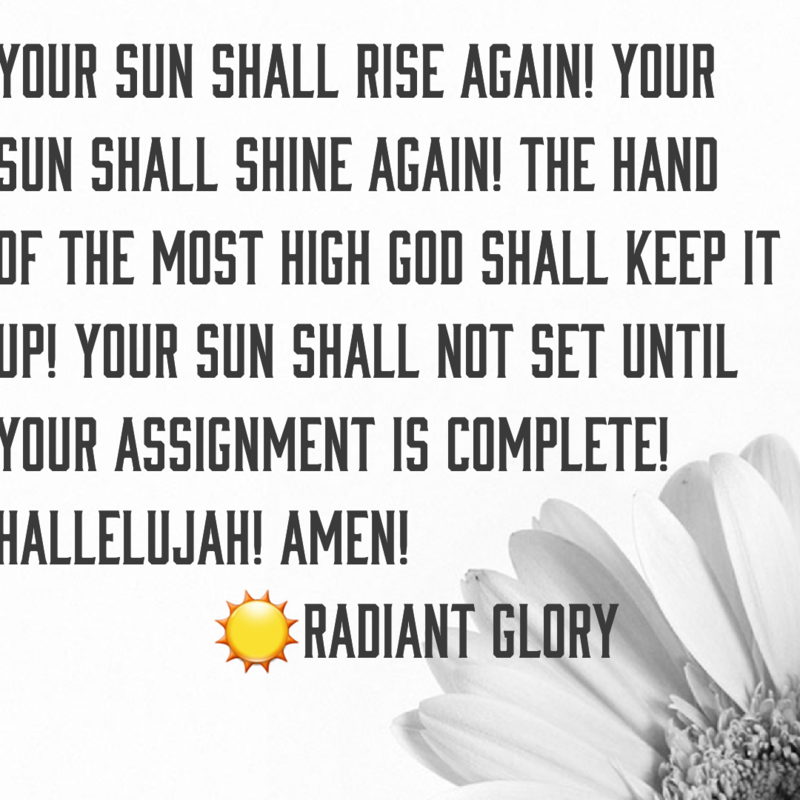 The Sun of Righteousness has risen for you! Malachi 4:2 But to you who fear my name the Sun of Righteousness shall arise with healing in His wings; And you shall go out and grow fat like stall-fed calves. 3 You shall trample the wicked, for they shall be ashes under the soles of your feet on the day that I do this,” Says the Lord of hosts. Receive the Light of God for illumination, direction, sustenance, health, and joy in Jesus’ Name. Amen! Open Heavens Devotional 2018. Working In You! A Great Pleasure!!!! One thing I have realized about prayer is that, it is a tool of communicating with Our Father in heaven. There are various means of communication, from man to man – we talk, look, write, gesture, use signs, and even through body language. This is natural for every being. To our Father in heaven however, we talk,we sing, and communicate with our heart also. I would say mostly with our heart!!!!! Prayer then are initiated most often by us when we are in need, to some it is a religion, to others it is a way of life – a relationship. You cannot be in a relationship without communicating. Sometimes it is easy to talk to God about everything and other times it is difficult because we get overwhelm by events around us, the tumult of our hearts and more. This is when the Holy Spirit comes in to help us. Romans 8:26 In the same way, the Spirit helps us in our weakness. We do not know what we ought to pray for, but the Spirit himself intercedes for us through wordless groans. 27 And he who searches our hearts knows the mind of the Spirit, because the Spirit intercedes for God’s people in accordance with the will of God. The initiator most often is us, as a being seeking the face of the Almighty we have erroneously believed. However, I have found out that God initiate this communication. How do I know that? What do I mean you might ask? Remember that in Genesis 3:9 But the Lord God called to the man, “Where are you? This was after Eve and Adam ate the fruit of the tree. In the cool of the day the Lord sought them out but they hid. How often have you and I hidden from the Lord? How often we hide our flaws instead of asking for His help to make it right or remove it. How often? Philippians 2:13 For it is God who works in you both to will and to act for His good pleasure. Friends, God always desirous of good for His creation has plan for us in point Z and then comes to point a b c d …. stirring you and I up by His Holy Spirit to pray, sing, worship and so on so that He can bring to past that which He has already prepared in advance. Ephesians 2:10 says it clearly ” For we are God’s workmanship, created in Christ Jesus to do good works, which God prepared in advance for us to do. 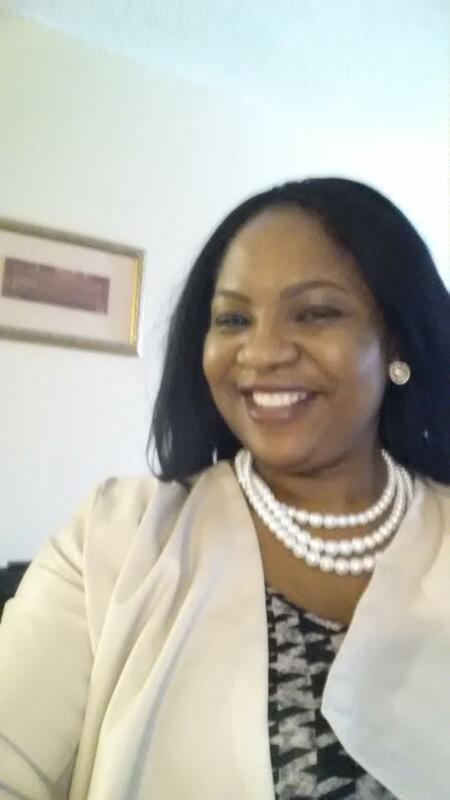 You then my friend, you are blessed and highly favored for the Lord Himself came down to visit you. He is working in you to will and to act in order to fulfill His good pleasure in you. Those times you did not feel like praying and you just suddenly found yourself praying and things begin to happen, you just know that there is God in it. See it is not because you made up your mind to do so, neither is it your will power. He works in you to will and to do!!! He is working it out according to His good pleasure. He will glorify Himself in you trust me. Why not put a praise on it. Sing like never before for God is always listening. God is calling out to you right now friends, please don’t hide from Him for He loves you-Genesis 3:9!!!! You are a city set on a hill that cannot be hidden. You have been like a big bull caught in the bush on a plain field, everyone can see and hear,none offered help, but Christ, the Lion of the Tribe of Judah, the Holy One of Israel is loosening the thicket, you are been set free for grazing in the abundance of God’s provision. Your horn are been set free, your bellowing heard in the land, to the uttermost and the strangers shall hear and take flight. Arise then you favored one! Arise in the capability of the power of Him who raised Christ from the dead! Arise and shine, for your light has come! God’s Injunction for Me! And You! Future Glory for Jerusalem, You and Me too! Isaiah 60 “Arise, Jerusalem! Let your light shine for all to see. led by the great ships of Tarshish. carrying their silver and gold. for he has filled you with splendor. I will now have mercy on you through my grace. to receive the wealth of many lands. My Temple will be glorious! will come and bow before you. and Zion of the Holy One of Israel. a joy to all generations. nursing at the breast of a queen. the Mighty One of Israel. and your stones for iron. the desolation and destruction of war will end. and praise will be on the lips of all who enter there. 21 All your people will be righteous. in order to bring myself glory. and the tiniest group will become a mighty nation.